A conversation with Evelyn Shelton is like multiple master classes rolled into one. “You can do anything you want, at any point,” says Shelton, chef-owner of Evelyn’s Food Love. She means it sincerely and her work is her testimony. In May, Evelyn’s Food Love will celebrate its second anniversary, an achievement many years in the making. Growing up Shelton knew she would open a restaurant. “I always thought I would open a jazz supper club with a big band where people would have to dress up, and we’d have this really shi shi foo foo menu, and it would be this great time; a big party every night.” Evelyn’s Food Love, while not a jazz supper club, is a cozy spot with a special rhythm of its own. Shelton elevates comfort food favorites with dishes like wine-braised ox tails and roasted cornish hens while still remaining approachable. “Of course being on the South Side you have to have some chicken wings. It’s a must! You’ll get kicked off the South Side if you don’t have some chicken wings,” Shelton jokes. 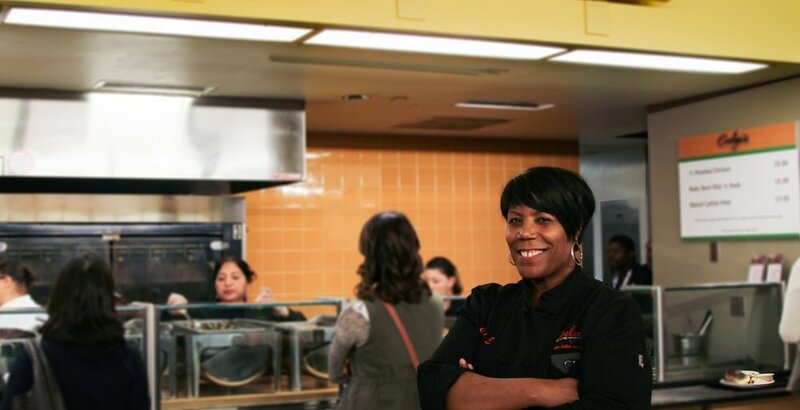 The hospitality veteran left a 20-year long career at Northwestern Hospital to follow her dreams of attending culinary school and enrolled in an accelerated program for students with at least a Bachelor’s degree, Shelton already had a Master’s. “I loved culinary school so much,” Shelton says with a smile. She only missed two days of class including the day when she was en route but got stuck in gridlock — President Obama was home. Culinary school touched Shelton to the core. “I cried when I left. The experience, the sights, the sounds the smells,” she says fondly. A second Evelyn’s Food Love has recently opened in McCormick Place, the largest convention center in America, giving visitors from around the globe the chance to taste what Evelyn’s Food Love is all about.